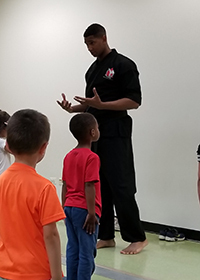 [/vc_column_text][vc_column_text css_animation=”right-to-left”]Sensei Marquinn McDonald is a 4th degree Black Belt and has been studying martial arts for 32 years and the sport of boxing for 15. His studies in the martial arts include Shorin-Ryu Karate, boxing, kick boxing, and Brazilian Jiu-Jitsu. Sensei Marquinn is a 2002 SKi World Champion and has won multiple national championships and titles in sport karate. In addition to his karate titles, he is a 2014 Chicago Golden Gloves runner up and he continues to compete in sport karate and boxing to this day. Though he believes he is always a student, teaching is his passion. 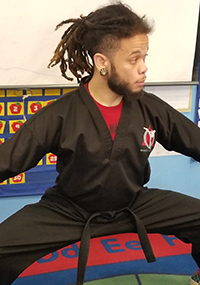 Sensei Marquinn, or Coach Q as some of his students call him, has taught both martial arts and boxing to people of all ages, while also using them as a means for mentoring young men, teaching life skills in an alternative school setting, and helping adults reach their fitness goals. He has worked with World Sports Chicago, Becoming A Man (B.A.M. ), Chatham Academy High School, and a number of elementary and high schools in and around the Chicagoland area. Additionally, he has trained young people with varying degrees of skill and ability with an understanding that you must meet students where they are. WE ARE PASSIONATE. WE ARE COMMITTED. WE ARE DRIVEN. Our Instructors Are Ready to Teach YOU! Sensei Brandon has been practicing Karate since the age of 4. He has competed in karate around the world since childhood. Karate is his passion and he loves teaching. Sensei Raizen has been practicing Karate since the age of 3. He also specializes in teaching gymnastics to children 3 and older and is our forms / kata coach.